We had a new departure point for the May Healthy Ride + with 24 cyclists leaving from Emma Cons Gardens opposite The Old Vic (for anyone interested Emma Cons was ‘an ardent reformer and legendary impresario’ who managed the theatre from 1880 until her death in 1912). It was heartening to see so many regular riders from the East of the borough and further afield, (some organised their own feeder rides into Waterloo), prepared to venture further West than we’d ever been before on a round trip of 17 miles (27.5k). 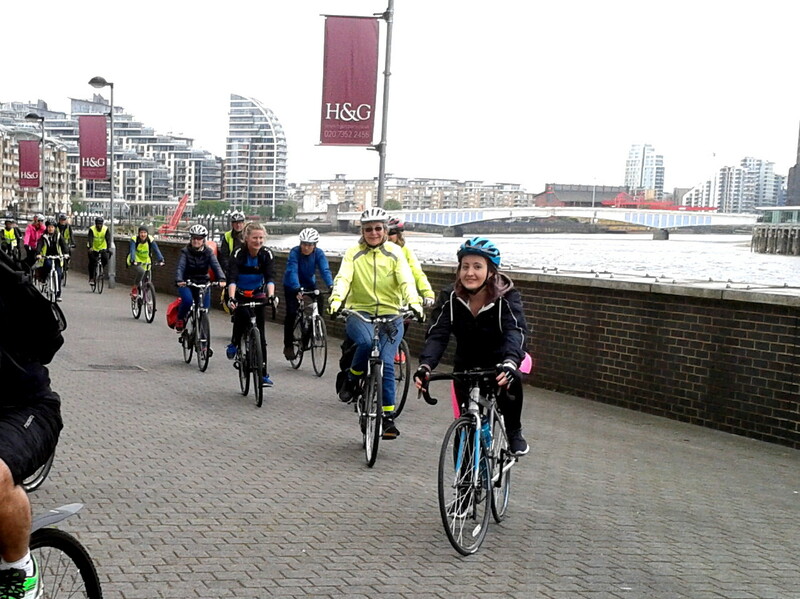 The outward journey took us through quieter streets of Lambeth and Kennington across Spring Gardens (formerly the site of Vauxhall Pleasure Gardens popular with Londoners for nearly 200 years until 1810) and over Vauxhall Bridge using the new cycle lane of CS5. On reaching the Grosvenor Road junction we re-oriented ourselves to continue westwards following the river – from Chelsea Bridge to Lots Road pavement cycling is permitted but we stayed on the road with fairly light traffic throughout, avoiding any hold-ups at Albert Bridge by whizzing through the tunnel underneath. A brief comfort stop at Cremorne Gardens (another site of pleasure gardens which flourished in the mid-1800s) then on past the massive Lots Road power station, a listed structure on an 8 acre site being redeveloped into the inevitable ‘luxury apartments’ with a starting price of 1.7million… We made steady progress from Chelsea Harbour through residential streets of Fulham arriving at the café in Bishops Park in excellent time considering our large number. While some of us stayed close to the facilities and socialised, Bruce led an expedition to look at neighbouring Fulham Palace and the memorial to members of the International Brigade who volunteered to fight in the Spanish Civil War. On our return journey we crossed over Wandsworth Bridge and headed back East all along the river frontage past St Mary’s Church, where we paused to marvel at the almost rural tranquillity of the setting before realising it is practically next door to the London Heliport! We were soon back on familiar territory with a lap around Battersea Park then on to Nine Elms Lane, Albert Embankment and Lambeth Walk (where we didn’t stop to do the dance! ), arriving in Waterloo with 20 minutes to spare, marvelous! Thanks to Jane for leading and for providing this report.